Andrew Yori, Mayo’s Own K-9 Ninja, is Headed to Vegas, Baby! That episode aired last week. And for Andrew's fans, it was a nail biter. Fifteen contestants would move on to the finals in Las Vegas. And with one contestant yet to run the course, Andrew was in 15th place. Standing between him and a ticket to Sin City was Lorin Ball, a five-time finalist who has posted some of the fastest course times on the show. "I was fully expecting to watch Lorin beat me and to be sent home," Andrew tells us. Instead, Lorin fell on the second obstacle of the course — guaranteeing Andrew a spot in the Vegas finals. As his reaction in this clip suggests, he was "shocked" by the turn of events. "It wasn't really the way that I wanted to advance, but falls are part of the show, so I'll take it," he tells us. As will his fans — including his colleagues at Mayo Clinic, two of whom traveled to Indianapolis to be part of his cheering section (referred to as "the Dog Pound" by the show's hosts, a nod to Andrew's role as an advocate for shelter dogs). And the support he's received extends beyond his co-workers. "I've been contacted by a lot of other Mayo employees, as well, congratulating me and telling me that they love watching me and thanking me for speaking up for dogs in need," Andrew says. "It's been great to know I have so much support." Andrew recently discovered he has support from another fan base as well: The 18-and-under set. He has "been thanked multiple times by people for giving their children a positive role model to look up to." That's a position "I don't plan to take lightly," he tells us. 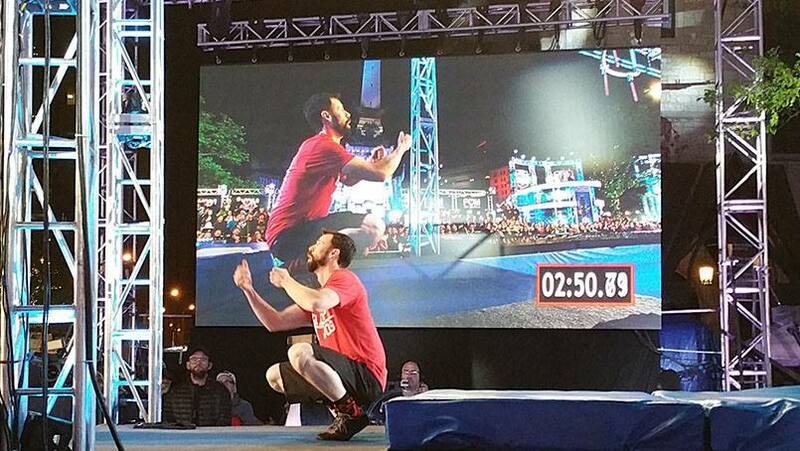 Though Andrew has already competed in Vegas, you'll have to wait until the American Ninja Warrior finals air on Aug. 29 to find out how he fared. Regardless of the outcome, Andrew tells us he plans to try and compete again next year. "There will be new obstacles that I know I'm going to want to try and conquer," he tells us. If you're in the Rochester area and would like to meet Andrew (and his dog, Angus), stop by the Dogs Downtown event at the Peace Plaza on Sunday, Aug. 7, from 11 a.m. to 3 p.m. Andrew will be there with books, Adopt a Dog K9 Ninja stickers, and photos to autograph. All proceeds will benefit the Wallace the Pit Bull Foundation. Before you go, leave a comment below and use the social media tools to share this story with others. I’ve known Roo for years and have found him to be such a compassionate, intelligent and positive role model for people everywhere. Roo has followers all over the world and it’s not a wonder why.